Oh, The Hired Girl, the book that has launched what seems like an insane amount of conversation for something that struck me as… slight. First, the controversial passage and the conversation surrounding it: I strongly recommend popping over to the Heavy Medal post and settling in to read the extensive conversation in the comments. I will say that as far as the comparison that sparked so much of the conversation (“It seemed to me… Jewish people were like Indians…”), it definitely jumped out at me (as an ouch moment on two counts, for both named populations). I read this as a loaded but deliberate choice: Schlitz uses a stereotype the average reader (10 & up) should immediately recognize as deeply problematic (the idea of the uncivilized, almost imaginary, generic “Indian”) to reflect for the reader the way Jewish people were seen at the time, since most contemporary readers probably won’t know a great deal about anti-semitism or the Jewish history of being othered and persecuted outside of the Holocaust (which obviously is a pretty huge example — but many of the younger students I’ve known, especially not-Jewish students in the Northeast, think the Holocaust and Hitler’s antisemitism was a largely localized issue, and don’t understand the greater context). I’m not the only reader who read the passage this way (again, see Heavy Medal); likewise, this doesn’t necessarily change that this is a problematic passage. This is a tiny example in a single book that speaks to the need to have these hard conversations, and the level of discourse and respect happening is inspiring. There’s also the question of what it means to have a book about religion that is so much about the Jewish experience yet is narrated by a Christian, and I have spent hours unpacking that in conversations with others. I loved seeing what could be my own family history in a book (my maternal great-grandparents were German Jews whose families came over in the later 1800s and who were assimilated, but not too assimilated — I was raised Reform but we certainly never drank milk with dinner, because the memory of keeping Kosher ran deeper than the actual keeping). On the other hand, I hated the conversion story line — I don’t care if she repents, it still was physically uncomfortable to read. Joan’s religious growth is a lovely narrative, but juxtaposed against another religion it did leave me feeling like there was a subtle message that Judaism is all very well, but clearly the Catholics are the one who have actually seen the light. I don’t think this is at all deliberate and I also think it will only read this way for a small portion of readers, but personally it definitely affected my reading, and that kind of divisive reading of a text can certainly come into play in award conversations, as can questions of representation and accuracy. Aside from all that — although the nuanced discussion at Heavy Medal and elsewhere online has been incredibly enlightening and was my primary impetus to actually finish the novel, which I had put aside with 40 pages to go — does this have a chance? Well… I think it reads young, but certainly falls into the bottom end of the Printz age bracket. Does it strike me as an excellent YA book? There’s a classic developmental asset narrative here (the acted upon to acting upon/gaining of agency journey), which has always been a large piece of what I use to separate children’s from YA (also there’s a gut level aspect to separating the two). But then at the end Joan is literally allowed to be a child again, which is a really interesting ending to that journey from the perspective of development and growth, and makes this feel a bit more children’s territory to me (remember, though, that I specialize in 14 & up readers and books, so sometimes I have a harder time assessing the books at the young end, and if I were discussing this at the table I doubt I would get away with saying that without a LOT of discussion). In the end, when I go back to the criteria, the biggest hurdle will be the pacing. Whether the open is too long, the ending (way) too abrupt, or the middle just too meandering is up for discussion. The fact that it has come up for several readers does indicate that something is off balance. And there are a few plausibility issues — even today, as a (very) Reform Jew, if I had a caregiver for my son try to convert him, she or he would be fired immediately. It’s that big of a deal. For me, that was the crack in the windshield that made the whole book fall apart: the books Joan had read were a little too on the nose; the way everything worked out was too convenient and plot, such as it was, was absurd; and the way Joan sees what Mr. Rosenbach and everyone else can’t about his children is terribly artificial when you think about it. 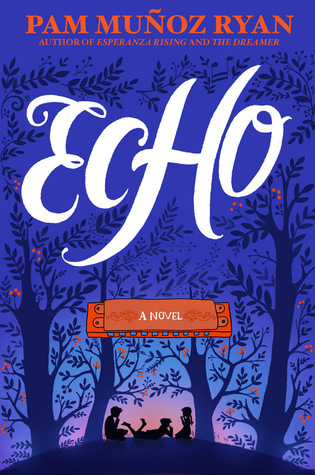 If you’ve never heard classical music played on a harmonica and weren’t inspired to find some after reading Echo, I would be surprised. However, I’m a helpful librarian so here’s a link to watch a boy playing Rhapsody in Blue on harmonica. You’re welcome. I know you’ve just had your mind blown (how does that tiny instrument do that??) but go ahead and let that play while you read on. In Echo, there is much to admire. Pam Muñoz Ryan writes lovely sentences, particularly when describing sound and music. The songs and classical pieces referenced are well placed and meaningful. (No, I didn’t cry when she quotes “Some Enchanted Evening” at the end of Part Four. You did.) She also has a good sense of pacing and rhythm. Throughout the novel, she controls dramatic tension using shorter sentences or single line paragraphs. When combined with her lush descriptive writing, as it is at the end of Part Two when Mike attempts to run away, this technique serves the story well. Maintaining narrative momentum in a novel that’s split into six parts (five if you consider the prologue and epilogue as two halves of a larger frame) can’t have been easy. Each section is populated with fully realized characters, dramatic conflicts, and rich settings. We leave each story on a cliffhanger, but they work as deliberately unresolved endings. It would be incredibly frustrating to not know what happened to Friedrich, Mike, or Ivy, but it isn’t necessary to appreciate their stories. I’ve talked to several people who think the success of the book lives or dies in Part Four. To some readers, it stretches the limits of plausibility; to others it’s the section that unites the novel. I believe it’s the latter. It’s entirely appropriate for this novel to unite the three characters and their stories in its ending. When each character plays that unusual Hohner harmonica marked with the red M for the first time, they recognize the instrument’s unique sound and feel as though the music is reaching into something inside of themselves. Other characters also notice the different sound. Friedrich’s father says, “It’s as if you are playing three instruments, not one.” The epilogue proves that the harmonica sounds like this because it’s the same one that the three sisters from the fairy tale, Eins, Zwei, and Drei, imbued with those qualities. Kenny Yamamoto’s near-death experience during the war demonstrates that the instrument returned to them, completing its journey, freeing them from the witch’s curse. In the prologue the sisters say, “When you play… you will forever be joined to us, to all who have played the harp, and to all who will pay it, by the silken thread of destiny.” Therefore, of course our three main protagonists end up in the same place on the same night, because it’s magic, music, and destiny that bring them together. *Also the name of our upcoming real life combo Mock event; if you are in the NYC area and want to join in, email one of us for details. Just went and caught up with the excellent conversation on Read Roger about the conversation on Heavy Medal: http://www.hbook.com/2015/10/blogs/read-roger/which-book-will-hurt-which-reader-how. Sometimes I dunno why I bother posting thoughts when so many more articulate souls have said it all already, and better! Karyn, your post brought to mind an old Richard Peck YA, THE LAST SAFE PLACE ON EARTH. Do you know it? Also attempted conversion by a babysitter (though in the case it’s mainline Protestants bedeviled by a fundamentalist). Thank you for saying what I couldn’t put my finger on about Hired Girl. I just plain got tired of it and tired of Joan/Janet. In fact I was ready to abandon the book entirely at midpoint but decided instead to speed read to the end, mostly to see what happened with her dad, of all things. Your comments about religion were spot on, too. So many things about the book just didn’t settle and I hope the Real Committee sees the flaws. Printzbery-wise, has anyone commented on Finding the Worm by Mark Goldblatt and The Seventh Most Important Thing by Shelley Pearsall yet? I thought both were spectacular but haven’t seen any buzz on either of them. Just wondering. Finished! SO MANY FEELINGS, most of them conflicted. 1. I had the same confused ending as you, in that her agency is kind of taken away at the end? It’s more of a circular growth than an upward trend of agency re: YA and development. 2. I had no problem with the passage. At all. I trust that a reader ready to tackle this book can parse what it means and what it doesn’t mean. 3. Because of that passage, and some other nuances, I think this is a Printz contender, not a Newbery, even though SHE’s at the lower end of the age range, I think the story reads more YA to me. 4. I actually liked seeing Judaism through Joan’s eyes, especially as she started using Yiddish by the end and telling them what good Jews do. I had a problem with how she fetishized David’s appearance, and I thought the conversion scene was accurate in a cringe-worthy way. I would’ve liked more nuance on how the Rosenbachs were magnates, but still likely segregated into Jewish parts of town/clubs/etc– even the really wealthy at that point would not have accepted them into their world. 5. I probably have a million more thoughts. We’ll discuss in person!